Billions of dollars are being spent every year on new technology. 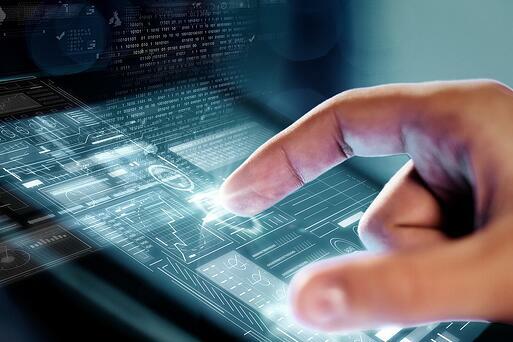 From CRM’s to ERP’s to many other technological advances, almost every organization we work with is implementing a new technological advance in one department or another (if not organization wide). But, are these organizations getting their money’s worth from their investments? Unfortunately, return on investment is not a guarantee. When things don’t go as planned, senior executives often blame the systems themselves. But, as change management experts, we know technological integrity is rarely the source of the problem. In fact, buying and installing new technology is actually the easy part. Making sure users adopt the new system to its full capacity and continue to use the new processes on a sustained basis is where most organizations fall short. When it comes to implementing new technology, here are 5 lessons we’ve learned from the multitude of implementations we’ve done over the years. Installation of a new technology is defined as the “go live” or “cut over” date. The lights go on, the system is up and running, and the new processes are in place. Management declares the project complete and probably successful. This is what we like to call pre-mature project completion. Yes, installation is critical, but it’s not enough! What these organizations don’t realize is that if people’s behavior hasn’t changed, nothing has changed! Successful implementation is when the project is on time, on budget, all of the technical objectives have been met AND all of the business and human objectives have been met as well. 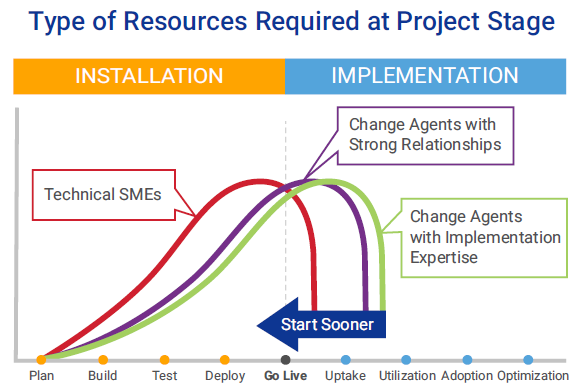 Achieving "implementation" during a technology upgrade is the "golden ring" of user adoption and value realization. In the real world, you will never have enough resources to implement a change. You just won’t. There are far too many other projects competing for the same resources. That’s why it is so important to use what you have effectively. For example, projects need to be resourced with the right people at the right stage of the project life cycle in order to be successful. During a technology implementation, it is very common to focus only on technical SMEs in the beginning of the implementation. However, for a project to reach full value optimization, a mix of SMEs and Change Agents who have strong relationships with Sponsors as well as Agents with implementation expertise need to be working together as early as the initial planning stage of a project. Change Agents must be focused on the right actions at the right time. Change management is not about busy work filling out templates and checklists. It’s about using your limited resources in order to get the maximum impact. During a technology implementation, it’s easy to be seduced by the activity of getting the system installed. But in order to reach sustained adoption, Change Agents need to be focused on doing the hard work of implementation. This includes Defining the Change in terms of the behavior you seek to see, Generating Sponsorship, Developing a Reinforcement Strategy, Communication Plan and Building Target Readiness. A cascade of committed Sponsors from the top down is the most critical success factor in ensuring a fast and successful implementation of any type of business change. In fact, getting a Sponsor to do what is needed is the most important action a Change Agent can take. That’s why at the beginning of a technology implementation, an effective Change Agent will look up the power structure before looking down. In other words, Change Agents should spend more time leveraging their Sponsors to be actively Expressing, Modeling and most importantly Reinforcing the change with their direct reports rather than spending time trying to convince the end users of the rationale for the change. While many organizations hope that a series of informational emails from top executives, cross-functional town hall meetings, and training will “convince” people to make the leap to adoption, these tactics are rarely enough. In order to ensure full value is reached a structured, purposeful change management process needs to be applied. IMA's proprietary Accelerating Implementation Methodology (AIM) is a robust planning and execution tool for the people side of an implementation. AIM's 10 core principles serve as the central cog of every project life cycle regardless if you are using Agile or a more traditional Waterfall project management protocol. As advances in technology continue to propel us into the future, your change management model needs to be prepared to do the same. AIM is Next Generation Change Management that was developed based on the lessons we've learned along the way. It's ready for the future. Are you?